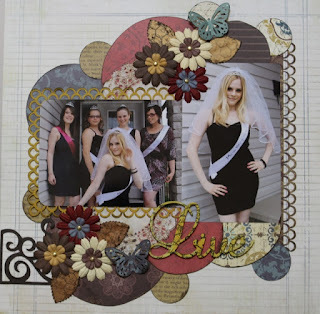 This month, the theme at Scrap Our Stash is to do a layout using circles! Well, I've managed to fit quite a few of them in there! I used some materials that I had in my stash for a long time. I only had bits and pieces of it, but they sure came in handy for this theme. The papers are from Prima called Reflections. I used up almost everything I had left from there and that is something I love to do! The photos are from my daughters stagette that was held before her wedding. Your girls are so much fun! Love it! As always your layout is fabulous. I love the punchwork and your design. Laya looks stunning, and the girls look like they are ready for a fun night out!